Ever since I rewound some 12V trafficators to make them work properly on 6V, they’ve always looked a bit lop sided. The reason for this is that one has a 6V bulb and the other has a 12V bulb. Not surprisingly, the 12 volter looks a bit feeble, not really a job at all. You’d think that changing a bulb would be simple enough… but just look what happens when a Festoon puts on weight! The smaller part is an original Lucas festoon bulb from a trafficator. The larger part is ALSO a standard Lucas festoon, but a brand new one. This may not matter in a modern interior light, but just try getting this inside the orange arm on a trafficator! Anyone who has tried to replace a Festoon bulb in a trafficator arm will have encountered some problems. New Festoon bulbs are much bigger in diameter than before, and simply do not fit inside the orange plastic housing. Also, there are very few, if any, 6V replacements available. So, if a bulb has failed in a trafficator, the only way ahead is to make one. The bulb is very crudely held in place between two moulded guides. Contact is made by a spring at the lower end and by bearing on to the earthed chrome cover at the top. So, it is necessary to make up a lamp that meets these mechanical requirements, whilst still being electrically compatible. This was done using an array of four LEDs. As the outer cover is orange, the LEDs must also be orange. Note that white LEDs will not work; they are predominantly blue and green in the spectrum and will be filtered out by the orange of the arm. 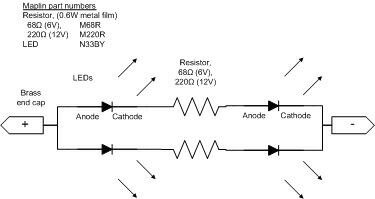 Four LEDS are needed as LEDs are very directional and somewhat small. By using four, two can point towards the back of the vehicle and two towards the front. Provided they are spaced out, the trafficators look quite similar to those that are filament lit. 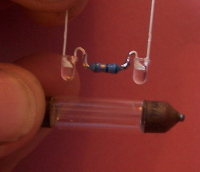 An old festoon bulb was dismantled in order to reuse the end caps. This is done by heating the glass envelope so as to burn off the adhesive and allow the caps to become loose. Take care when doing this: use pliers and protective glasses. Two banks of LEDs were assembled, so that they can be mounted facing in opposite directions. Each bank consisted of an orange 3mm LED (Maplin part number N33BY), a 0.6W resistor, (68 Ohms for 6V, 220 Ohms for 12V), and a second LED. Thus the resistor spaces the two LEDs out. 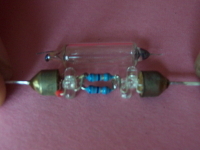 No circuit board was used so as to keep weight to a minimum: the LEDs and the resistor were folded to make a simple springy structure as shown in the photo. Note that it is important not to let the structure be either too long, (the overall length being 1½”) or too wide to fit in the slots. The best tool for this job is a pair of tweezers or very pointy pliers. Note also the LEDs are polarised. Before cutting or soldering, the shorter lead is the cathode, or negative connection. 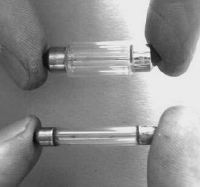 If the leads have already been cut, the cathode can be identified with a magnifying glass – it is the structure that is wedge shaped inside the plastic envelope. In addition, as the leads are quite short, it is important to make the solder joints quickly, to avoid overheating the LEDs themselves. 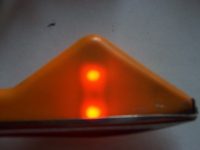 Once each bank of LEDs was assembled, the positive end (anode) was marked with a tiny piece of red sleeving. With a bit of careful bending and folding, the LEDs fit neatly between the end caps, one forward and one backward at each end. The leads from the LEDs were passed through the holes in the end caps, though these needed opening up slightly to get both wires through. After soldering, the excess wire was cut off. The assembly was inserted into the arm, noting that the polarity is important. If the car is negative earth, then the cathode is inserted LAST, as the earth connection is at the top. For positive earth cars, the cathode is inserted first. If this is inserted incorrectly, the LEDs will not be damaged; they simply won’t light. On reassembly the LEDs were found to be visible even in bright daylight and quite bright enough in the evening. This article, written by Geoff Hardman, originally appeared in CA7C Seven Focus in Jan 2007 pp16-17. Please see the original article for the full discussion on this topic. The use of LED light sources has been of interest to the historic vehicle community for as long as LEDs have been readily available and not surprisingly many articles have been written on the subject in both club magazines and in the specialist press. Unfortunately, not all of the information provided has been accurate and FBHVC felt it should research the subject to enable the provision of definitive guidance to its members. - Front Position Lamps. (Side lamps). Vehicles first registered before 1st January 1972. LED light sources in the original lamps are compliant. - Rear Position Lamps. (Tail lamps). Vehicles first registered before 1st January 1974. LED light sources in the original lamps are compliant. - Rear Registration Plate Lamps. Vehicles first registered before 1st April 1986. LED light sources in the original lamps are compliant. - Stop lamps. Vehicles first registered before 1st January 1971. LED light sources in the original lamps are compliant. - Stop lamps. Vehicles first registered after 1st January 1971. LED light sources in the original lamps are non-compliant. This is because LEDs will not meet the minimum wattages specified in the regulations. - Direction Indicators. (flashing type). LED light sources in the original lamps are non-compliant. This is because LEDs will not meet the minimum wattages specified in the regulations. - Headlamps. LED light sources in the original lamps are generally non-compliant. This is because LEDs will not meet the minimum wattages specified in the regulations. However, in some particular cases it may be possible to locate LED light sources of compliant wattage. The Road Vehicle Lighting Regulations, in addition to specifying which lamps are obligatory and the provisions they are required to meet, also permit the use of additional lamps, which are referred to as optional. These lamps are required to meet some but not all of the provisions specified for obligatory lamps with the result that there are no wattage requirements for optional headlamps, either dip or main beam.